Alexei Mordashov’s plan to revive the initial public offering (IPO) of his goldmining group Nord Gold has been reported to be aiming at a relaunch date before Christmas; his first attempt at selling shares on the London market was called off in February when market conditions were much more favourable to him than they are now. The current volatility in gold and other metals prices – Nord Gold documents are forecasting a 10% decline in gold prices between 2010 and 2012 — and in mining share prices, may compel another postponement for Nord Gold. At the same time, in the Yukon Supreme Court, in northern Canada, a legal test is currently under way of how Mordashov treats minority shareholders in his goldmining companies, which future Nord Gold sharebuyers may want to examine closely. In this case, which was first filed on December of 2010, and had its most recent hearing on September 8, a group of nineteen shareholders in the Crew Gold company, which Mordashov took over last year, are suing for tactics they claim obliged them to accept less than fair value for their shares. All the claimants are Norwegian. Their claim is that Nord Gold intentionally stiffed them for fair value of their shares when Nord Gold completed its minority offer and 100% acquisition of Crew Gold. That transaction was finalized between December 2010 and January 10, 2011, with the Crew Gold minorities in active dissent against the acquisition price of C$4.65 per share. That, according to the court papers, was “oppressive and unfairly prejudicial” to the minority shareholders. 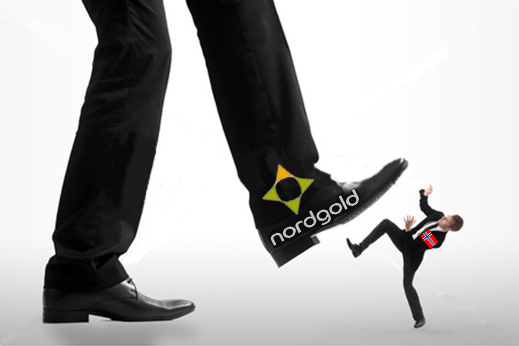 Also, according to the court papers, Nord Gold had failed to provide the market with an independent valuation of the company’s assets and the buy-back share price by invoking an exemption in the Canadian regulations applying when a single control shareholder held more than 90% of the shares. At the time, Mordashov held 93%; the minorities held just 7%. Just how significant Crew Gold was to Nord Gold, as it prepared for its London IPO in January of this year, can be gathered from Nord Gold chairman, Philip Baum, writing in the company’s annual report for 2010, dated May of 2011. “Higher sales volumes of gold, rising gold prices and the acquisition of Crew Gold helped us [Nord Gold] to increase revenues [in 2010] by US$236.6 million to US$754.2 million. Excluding crew Gold, revenues increased by US$138.0 million.” The revenue increase benefit of the Crew Gold takeover was US$98.6 million. The annual report provides other measures of Crew Gold’s value in Nord Gold’s balance-sheet and market capitalization. The report reveals, for example, that 70% of the 3.3 million tonnes of increase in ore mined by Nord Gold last year came from the Crew Gold operations in Guinea. Of Nord Gold’s reported increase of 81,100 ounces of gold sold in 2010, 73,300 oz (90%) came from Crew Gold. On Nord Gold’s balance-sheet, the item of net other operating income of US$20.1 million was boosted by US$16.1 million which came “from marking to fair value an equity interest we held in Crew Gold, before we acquired control.” Earnings (Ebitda) from Crew Gold operations were US$22.9 million out of the consolidated group Ebitda of US$366.9 million. Net income for Crew Gold is shown as US$1.3 million out of a group-wide total profit of US$147.9 million. In the group-wide asset count, Crew Gold is at US$17.1 million of current assets and US$73.4 million in inventories out of consolidated totals of US$212.2 million and US$281.2 million, respectively. The annual report is also forecasting rapid growth in extraction of ore from the Guinea operations – up 19% this year, up 25% in 2012, and up 7% in 2013. The Yukon lawsuit of the Norwegnian minorities is asking the court to assess fair value for the shares above what Mordashov obliged them to accept and paid them. According to court papers, the 19 Norwegian petitioners had held 265,811 shares, with the largest of the stakes at 175,000 shares, and the smallest 250 shares. In all, the petitioners held about 2.5% of the Crew Gold shares taken over by Nord Gold. The minorities claim that Mordashov had been in a “bitter conflict” with Frank Giustra, owner of Endeavour Capital, over how to run Crew Gold, when Endeavour held 43% of the goldminer’s shares. Giustra sold out rather than fight. The selling price generated a hefty profit for Giustra, but according to the Yukon court petition, it was insufficient several months later when Mordashov offered the minorities $4.65 per share. The court papers argue that the gold price had gone up; the reserves and output at Crew Gold were also up; and Mordashov’s group “had control of operations and news flow of the Company” to limit market understanding of the underlying value of the shares. This, the minority claimants say, was between C$7.24 when Mordashov started his takeover of Crew Gold in January 2010, and C$6.74 the following December. The difference between that price range and what the minorities were compelled to take adds up to about $687,000. That, plus legal costs, and any increment of fair value adjudicated by the Yukon court are at stake while the court considers its ruling. That such a small claim amount should trigger a costly court case indicates how fiercely minorities have been antagonized by Mordashov’s tactics. The Yukon court papers cite as examples the exemption from issuing an independent valuation before making the buy-back price offer, as well as the refusal by Nord Gold to accept as lawful the dissent notices which the shareholders sent in after the buy-back was announced. This is not the only case of a fight-back by minority shareholders against Mordashov. The resistance by High River Gold minorities to a buy-out of their shares proposed by Mordashov has been documented in detail over the past two years. The Yukon suit by the Crew Gold minorities is the first to go to court. Nord Gold and Mordashov spokesman, Sergei Loktionov, said in Moscow this week: “We don’t believe the rights of the minority shareholders were violated, and we are ready to defend our position in court”. An affidavit filed in the Yukon in April by Oleg Pelevin, head of strategy for Severstal Gold, a subsidiary of Nord Gold, argued that there had been technical and political problems for Crew Gold’s operations in Guinea before the Endeavour sale, and that the sale price of C$4.65 had been a fair one, above the trading average for 20 days before the Endeavour agreement to the sale and purchase offer. The subsequent exemption from an independent valuation before the buy-back offer was issued to the minorities was lawful under the Canadian market rule known as Multilateral Instrument 61-101. In the latest financial and operational report from Nord Gold, dated August 30, the litigation by the Norwegian minorities is not mentioned. There is nothing but a brief good-news mention of the Guinea gold operations. As for the ongoing problems Nord Gold faces in its negotiations with the Government of Guinea, Guinean sources report that newly elected president Alpha Conde has in mind to revive negotiations as soon as higher-priority conflicts between his Government and Rio Tinto, United Company Rusal, and Chinese investors in the Guinean minerals sector have been resolved. There is almost no reference to these problems in Nord Gold’s latest releases.